Pair of glass vases enameled painted, art nouveau. > DECORATIVE AND COLLECTIBLE ITEMS>ANTIQUE GLASS AND CRYSTAL>Pair of glass vases enameled painted, art nouveau. Pair of glass vases enameled painted, with scenes of landscapes, without signature, very likely Legras, beginning of the 20th. 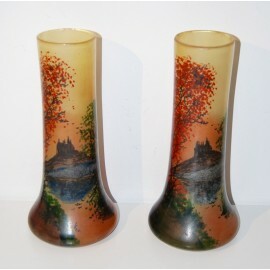 Pair of glass vases enameled painted, with scenes of landscapes, without signature, very likely Legras, beginning of the 20th century, art nouveau period.